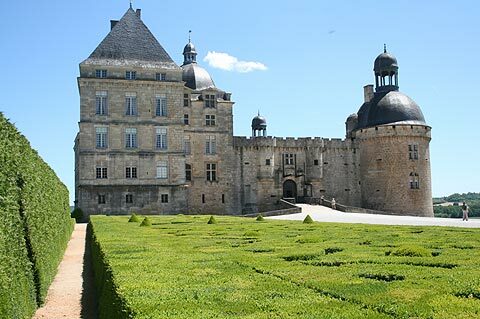 The Chateau de Hautefort is in the village of Hautefort in the Dordogne departement of France. The garden is situated in the Dordogne region of France, between Sarlat and Limoges not far from the Lascaux caves. The Chateau de Hautefort is one of the most prestigious castles in the SW of France and Les Jardins du Chateau de Hautefort are a classified historic monument. The gardens are also one of France's classified "Remarkable Jardins". 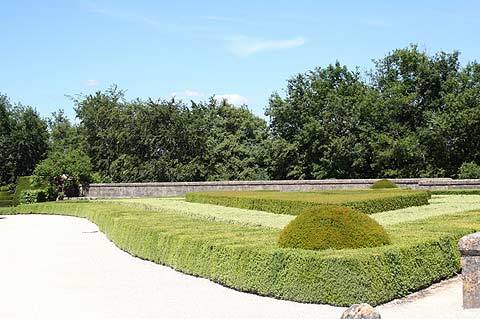 In 1853 le comte de Choulot, a famous landscape gardener of the time, reorganised the gardens into those we see today. 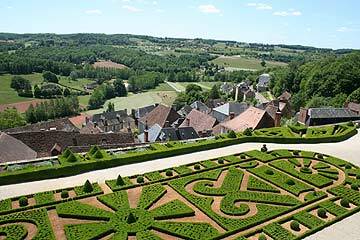 At the foot of the castle, overlooking the village are symetrically shaped parterres on the terraces. 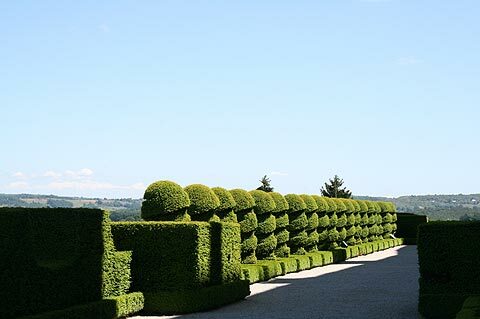 Topiaries decorate the parterres and some of these are clipped to represent the domes of the castle. 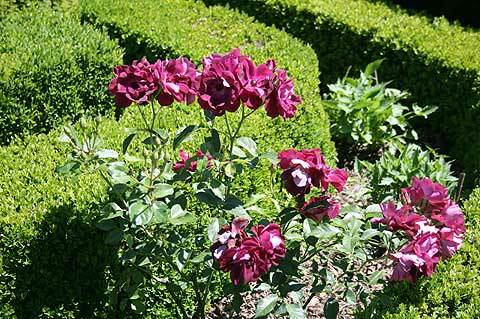 More parterres filled with flowers including some beautiful purple roses surround the castle. In the spring look out for the espaliered magnolias on the south wall. These are beautiful when in flower. 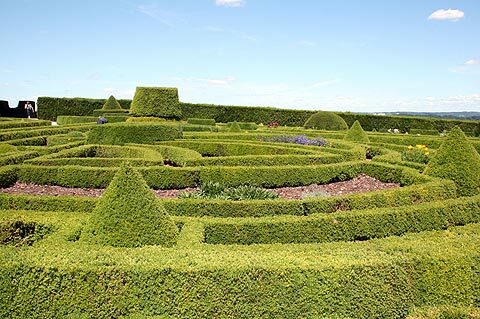 All in all there are more than three hectares of parterre with 10,000 box plants making up the box hedging. As well as the roses and flowers that fill the parterres the eastern parterre has been planted with traditional vegetables and seeds can be bought in the shop. Behind the castle there is a park with some superb viewpoints over the valley below. The park is full of mature trees and has some lovely vistas. The Chateau de Hautefort was used as one of the locations in the film "Ever After" starring Drew Barrymore. In the film the Chateau de Hautefort was Prince Henry's castle. Other locations in the neighbourhood were also used in the film. Of course the chateau is magnificent and well worth a visit too! March and 1-11 November, 14.00-18.00 weekends and bank holidays. In the summer the gardens are open on an evening for theatricalised visits. Visits cost 10 euros for adults and 5.50 euros for under 15s. Under 7s are free. The Jardins de l'Imaginaire is a beautiful contemporary garden which sits above the town of Terrasson. The Chateau du Losse and gardens is on a much smaller scale than that of Hautefort but it is very charming and picturesque.